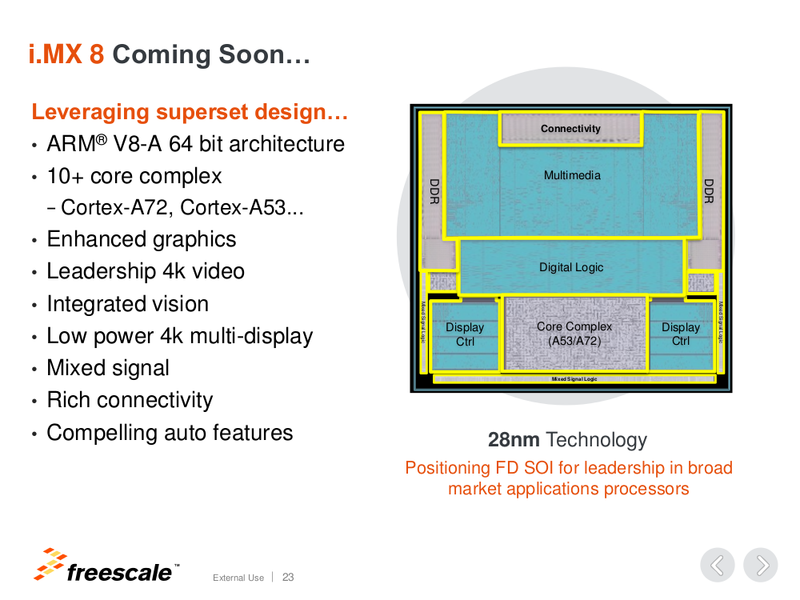 Freescale, now NXP, i.MX 8 processors have been a long time coming, but finally the company has now unveiled a Multisensory Enablement Kit based on i.MX 8 hexa core ARMv8 processor combined with a Vulkan-ready & OpenCL capable GPU. However, at the time of writing, there’s very little information about i.MX8 processors themselves, but I’m confident much more info should soon surface as NXP FTF 2016 is taking place now until May 19, 2016. The press release about i.MX8 MEK does mention 4K video and graphics, and some security features. The company expects the processor to be used for for intuitive gesture control, voice recognition, natural speech recognition and audio acceleration, as well as healthcare and industrial applications such as connected vehicles. 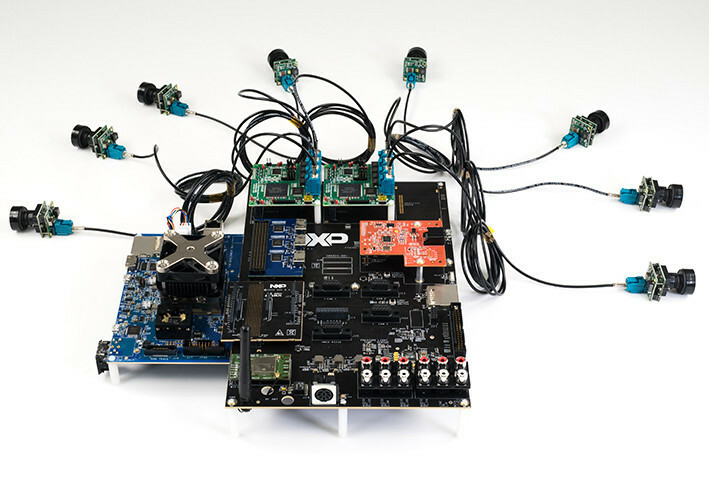 NXP i.MX 8 MEK is said to be available now, together with the BSPs and middleware. More details should eventually be posted on i.MX8 MEK page. [Update: I found a slide about i.MX8 with some details. Source: NXP Forums. That is good news. How about they license the i.MX 8 manufacturers in Shenzen to scale it and get it price competitive? Lot’s of design houses license their IP and still make money. maybe too pricey for most applications, imx6 itself it expensive already. A72 on 28nm is basically insane. They do have a heatsink and fan on their development platform. I think they’ll go into more expensive products like cars, healthcare or military, where you don’t care that much using a $20 or $100+ part. A72 does fine (as in better than A57) on 28nm, as long as you’re ok with the clock penalty. 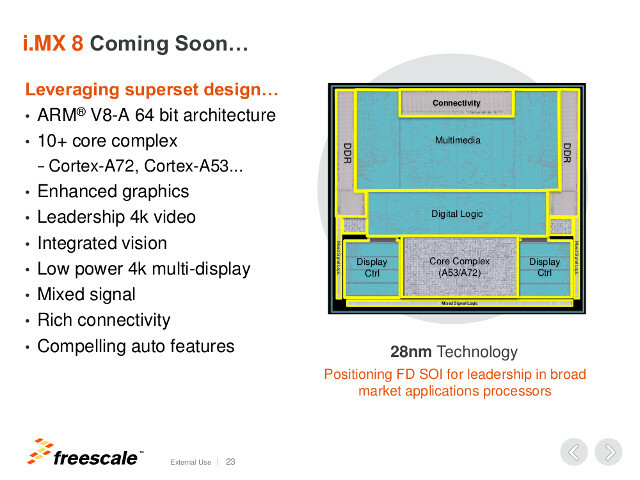 Yay for Freescale getting on the A72 bandwagon – Freescale have the best documentation in the business.